The Rachel 5.59 ft. Centre Drain Soaking Tub in White boasts a striking contrast of clean linear planes and soft curves for an impressive centrepiece in any bathroom. This modern bathtub is a beautiful contradiction of stark lines and organic curves, sure to enrich your powder room ambience and add a hint of sophistication. The acrylic construction is strong, light and warmer to the touch than typical steel or enamel tubs, allowing for easy installs and heat-retaining soaks. Chrome-finished overflow and drain outlets are included to give this elegant tub a polished look. Create a luxurious centrepiece for your bathing area with the Galina freestanding bathtub. Made for deep soaking and relaxation, the modern yet timeless design provides lumbar support at both ends, so you can stretch out in full comfort. With its crisp, clean lines and elegant profile, this versatile bath complements a wide range of bathroom styles and offers easy installation. A natural for showcasing a beautiful modern bathroom, with a nod to classic elegance. 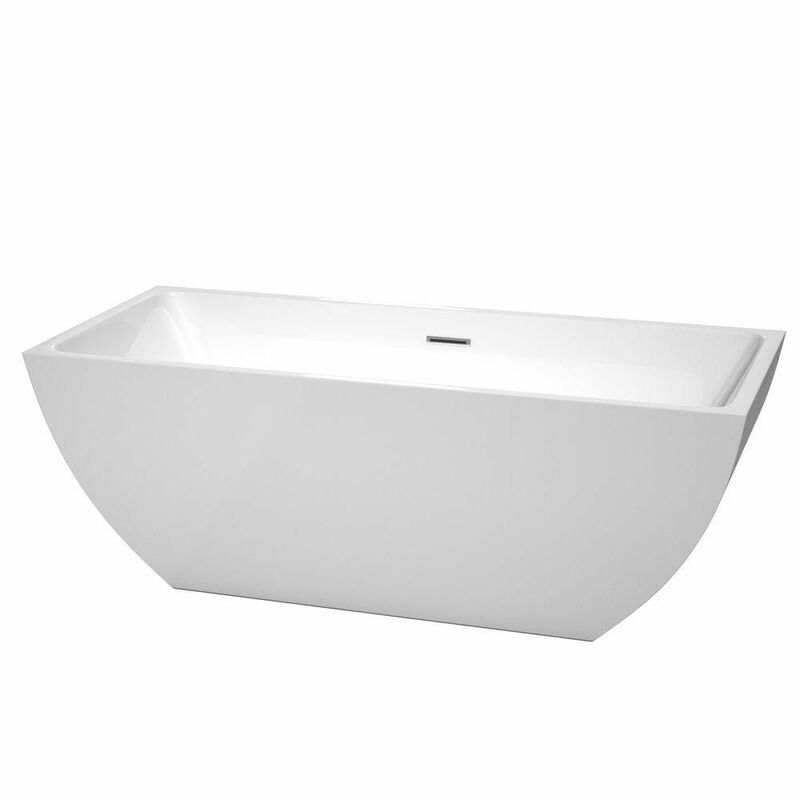 Rachel 67-inch Acrylic Flatbottom Centre Drain Soaking Tub in White The Rachel 5.59 ft. Centre Drain Soaking Tub in White boasts a striking contrast of clean linear planes and soft curves for an impressive centrepiece in any bathroom. This modern bathtub is a beautiful contradiction of stark lines and organic curves, sure to enrich your powder room ambience and add a hint of sophistication. The acrylic construction is strong, light and warmer to the touch than typical steel or enamel tubs, allowing for easy installs and heat-retaining soaks. Chrome-finished overflow and drain outlets are included to give this elegant tub a polished look. Rachel 67-inch Acrylic Flatbottom Centre Drain Soaking Tub in White is rated 4.0 out of 5 by 1.